There's clearly plenty to talk about when it comes to discussing the positive aspects of nanotechnology- life-saving developments in medicine, overcoming the worlds current environmental problems, other beneficial effects presented in this website and of course other positive additions which have not been mentioned on this website. It's also worth mentioning that there are new developments everyday which have yet to be documented or made publicly accessible. For me, having spent the last five months delving into the world of nanotechnology and what it's bringing to the table, the negatives would need to be highly weighted in order to sway my opinion that nanotechnology is anything other than brilliant! But there are certainly many sensible concerns surrounding nanotechnology, in particular the fate of nanoparticles. These may be particularly important if potential negative effects of nanoparticles are overlooked before they are released. Other points of thought in the positive/ negative discussion are mentioned below. 'Molecular Scale Manufacturing ensures that very little raw material is wasted and that we make only what we intend to make, no more. Factories begin to look more like clean rooms' Rogers, B Adams, J & Pennathur, S (2008) Nanotechnology Understanding Small Systems. Boca Raton: Taylor and Francis Group. A study in 2007 details how nanomaterials can be created that are not only safe, but also cost less and perform better than conventional materials. "Green Nanotechnology: It's Easier Than You Think," was written by the Washington D.C. think tank, the Woodrow Wilson International Center for Scholars. The study, which is free online, is based on a series of dialogues with scientists, policymakers and industry representatives about green nanotechnology. Nanotechnology is expected to be a $2.6 trillion market by 2015. Each country involved, including Ireland, have a bright financial future ahead when it comes to gaining money with nanotechnology. For us in Ireland nanotechnology has received excellent funding which is good to hear as nanotechnology could be a useful ploy in helping with our current national financial situation. On the instrumental level, concerns include the possibility of military applications of nanotechnology (for instance, as in implants and other means for soldier enhancement like those being developed at the Institute for Soldier Nanotechnologies at MIT) as well as enhanced surveillance capabilities through nano-sensors. There is also the possibility of nanotechnology being used to develop chemical weapons and because they will be able to develop the chemicals from the atom scale up, critics fear that chemical weapons developed from nano particles will be more dangerous than present chemical weapons. Nanotechnology is quite a new concept and some effects are time dependent so it's difficult for experts to predict the damage nanoparticles might do. There are concerns about how nano-particles may accumulate in nature. Could large amounts be ingested by fish? And if so, would if be harmful? Would the particles be passed along the food chain like DDT. Thresholds need to be determined. It's vital to find out how to remove or simply detect nanomaterials if they become problematic. The Project on Emerging Nanotechnologies (PEN), also Washington-based, says it has inventoried more than 600 consumer products in 20 countries with nano-scale materials, and "new nanotech products are hitting the market at the rate of three to four per week." The interest in nanomaterials is coming at a time of growing awareness of how chemicals – many of which we don't know are manufactured into the products we use on a daily basis – may be causing us harm. Of the US$710 million spent in 2002 by the U.S. government on nanotechnology research, only $500,000 was spent on environmental impact assessments. Some worry that nanotechnology will end up like virtual reality -- in other words, the hype surrounding nanotechnology will continue to build until the limitations of the field become public knowledge, and then interest (and funding) will quickly dissipate. ''Those nations, governments, organizations, and citizens who are unaware of this impending power shift must be informed and enabled so that they may adequately adapt'' James Canton, President of the Institute for Global Futures, said of nanotechnology and its disruptive economical potential. Social justice and civil libertiesConcerns are frequently raised that the claimed benefits of nanotechnology will not be evenly distributed, and that any benefits (including technical and/or economic) associated with nanotechnology will only reach affluent nations. The majority of nanotechnology research and development - and patents for nanomaterials and products - is concentrated in developed countries (including the United States, Japan, Germany, Canada and France). In addition, most patents related to nanotechnology are concentrated amongst few multinational corporations, including IBM, Micron Technologies, Advanced Micro Devices and Intel. This has led to fears that it will be unlikely that developing countries will have access to the infrastructure, funding and human resources required to support nanotechnology research and development, and that this is likely to exacerbate such inequalities. The agriculture and food industries demonstrate the concentration of nanotechnology related patents. Patents over seeds, plant material, animal and other agri-food techniques are already concentrated amongst a few corporations. 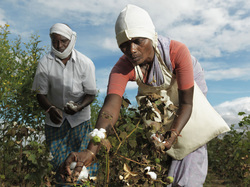 This is anticipated to increase the cost of farming, by increasing farmers' input dependence. This may marginalize poorer farmers, including those living in developing countries. Scrinis G, and Lyons K (2007). "The Emerging Nano-Corporate Paradigm and the Transformation of Agri-Food Systems". International Journal of Sociology of Agriculture and Food 15. A concern which I have not encountered is that of good will and intentions in the nanotechnology 'industry'. There is so much money involved in nanotechnology and such profits to be made that I think there may be a problem with industries' goodwill. I think that because nanotechnology is on the fast track of combining specialized science and worldwide consumer goods that they may take advantage of the general public's lack of knowledge in the area. It's very important for everyone to be aware that there are concerns with the safety of the products which have yet to be sufficiently regulated. Where there are huge sums of money in question I would be skeptical that there isn't a hint of snobbery or possessiveness against the general public in the way of withholding trade secrets, trade secrets which may actually be required if regulations are to be sufficiently carried out. With a hint of this pretension; carbon nanotubes are poised to become a major traded commodity with the potential to replace major conventional raw materials. However, as their use expands, anyone seeking to (legally) manufacture or sell carbon nanotubes, no matter what the application, must first buy a license from NEC or IBM. I think it is also worth mentioning a report I came across on e-paper (nanotechnology based) which details forecasts and markets of the product. None of this report was available to the public. In order to read this short report of 151 pages one must buy it in PDF or hard copy form for £2750! Personally this strikes me as slightly ominous. Overall, from what we know so far, the positives of nanotechnology tip the scale. I personally am of the mindset that the future is bright and wonderful with a world that is an easy and wholesome place to live in, and If there's one lesson which can be taken away from all of this let it be ANYTHING IS POSSIBLE!